The wax plant is one that loves to be ignored! The long, slender vines of this plant are covered with thick, green leathery leaves which are sometimes flecked with creamy white. 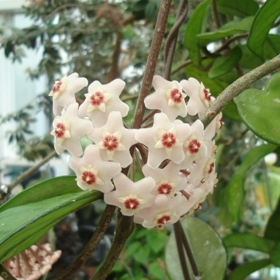 Although Hoya carnosa may take several years to produce its first flowers, once it does, it will bloom every year. The gorgeous parachute clusters of sweet-scented, star-shaped, white to pink flowers with five-point centres are a bonus to this already beautiful plant. The blooms become more magnificent the older this long-lived plant gets and plants flower best when they are slightly pot-bound. Just make sure you don’t prune off the leafless stem where flowers have been produced because flowers will form on the same spurs year after year.